After cold temperatures postponed Friday’s game against Xavier, the Cards took advice from Chicago Cubs great, the late Ernie Banks, and played two. In game one, the Cards fell 2-1 to the Musketeers, but were able to get a 6-3 victory in the second. It was the second double-header for Louisville this season, the first coming last weekend against Arkansas State, which they also split. In game one, offense was hard to come by. The two Xavier runs came by way of an infield single by Derek Hasenbeck and a ground out by Patrick Jones, both in the seventh inning. Louisville scored their run in the eighth with the bases loaded off a line drive by catcher Will Smith that plated Ryan Summers. The Cards didn’t have many scoring opportunities, only making serious threats in the fourth, sixth and the eighth innings. They left eight runners on base, including the bases loaded in the eighth. Xavier left the bases loaded themselves in the third and finished with 10 runners stranded. Both teams also made their fair share of errors: Louisville had three while the Musketeers made two. Hits were even at eight. “Offensively, we weren’t able to do enough and we made some defensive blunders there. Base running, I think I did a poor job coaching in that first game,” McDonnell said. In game two, the two teams traded blows early. Xavier started off the scoring in the first inning after Hasenbeck’s double scored Joe Forney. Zach Lucas led off the bottom of the second inning with a solo home run to tie the game. A walk, stolen base and balk put David Morton on third where he was driven in by Andre Jernigan to put Xavier up 2-1. Brendan McKay’s double scored Sutton Whiting to tie the game again. In the sixth, a wild pitch scored Jernigan to give the Musketeers the lead. In the eighth inning, the Cards exploded. Three straight walks loaded the bases for freshman Devin Hairston who ripped a double down the left field line to clear the bases. “The first pitch he threw to me was a ball, low and in, so I was just thinking inside pitch. He came back with another fastball and I was just able to get my hands to it and drive it down the line,” Hairston, a middle infielder, said. Hairston advanced to third on a wild pitch and was driven in by Whiting to give the Cards an insurance run they wouldn’t need. Cardinal ace Kyle Funkhouser dropped to 1-2 on the year with the loss in game one, but had a good outing. In seven innings, he struck out seven and gave up seven hits. Both runs he allowed were unearned. Xavier’s Brad Kirschner struck out three and allowed no runs in his six innings of work, resulting in his second win of the season. Junior Anthony Kidston started the second game for the Cards and struck out a career-high 10 batters, but a high-pitch count forced him out in the fifth inning. Robert Strader replaced him and earned the win with two and a third inning of work in which he struck out four of the nine batters he faced. McKay came in in the ninth to earn the save, striking out the side. “Our starting pitchers gave us a chance to win. Funkhouser and Kidston do what they usually do. Our bullpen was very good today,” McDonnell said. Both Funkhouser and Kidston threw over 120 pitches in Saturday’s double header, but despite the high pitch total, McDonnell isn’t worried about his two start arms. In the final match of the series, U of L took home a 2-0 victory, claiming the series. Sophomore Josh Rogers had his best outing of the year, throwing six and two-thirds scoreless innings and striking out nine en route to earning the win. Entering the game, Rogers had a dismal 15.95 earned run average, which he dropped down to 8.36. Louisville got big production from their freshmen. Brendan McKay and Devin Hairston accounted for all four of Louisville’s hits and drove in both of their runs. “It’s always good to see young players, because at least you know you got a few more of them contributing,” McDonnell said of the freshmen, but added that they need to production from the other freshmen as well. The Cards got their first run in the fourth inning when Hairston’s single scored Zach Lucas, who walked and stole second. The RBI is Hairston’s ninth on the season, and he has gotten at least one in every game he has started. 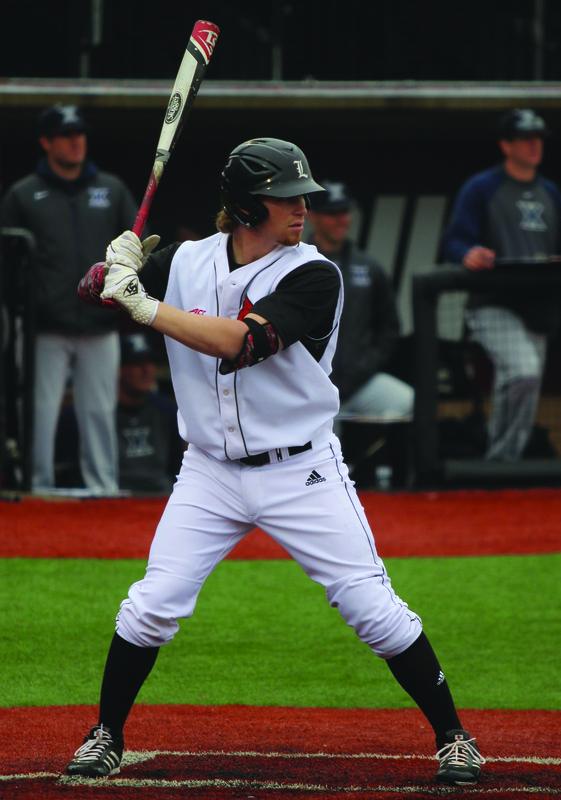 McKay added an insurance run in the eighth when he singled to center to score Sutton Whiting, who walked, stole second and advanced to third on a balk. McKay also entered the game in relief in the ninth inning to shut the door and earn his third save of the year. McKay finished the game going 3-4 with an RBI and struck out two for the save. His offensive production and his pitching make him a unique piece for the Cardinals. McKay can’t tell you where he fits in. “It’s kind of hard to say with how well I’ve done so far. I’d probably say pitching. I’ve been working on that a lot for a couple of years just trying to focus in on that and get better. But I’ve been hitting really well, too,” he said. “There’s some star power there. He seems very poised. He just plays the game. He trusts his ability and plays the game and that’s a special talent,” McDonnell said of the freshman. This year, the Cardinals are 7-4 in their first 11 games. After going to Florida and winning two of three, weather forced them to postpone their home opener. Instead, they traveled to Arkansas for a series against Arkansas State University, where they dropped two of three. They opened their home season with a Tuesday game against Butler, which they won convincingly, and followed it up with a victory of Eastern Kentucky the next day. “The exciting thing is that we can get better. We haven’t played great baseball; we’ve played good baseball. The kids have competed; we’ve been down a couple of times and fought back,” McDonnell said of the first month of the year. “I like this group; they work hard but the season says it all. We’ve got to show our toughness and we have to continue to grow and get better as the year goes on. The Cardinals hope they can continue to get better as they travel to EKU and then return home for their first Atlantic Coast Conference series against Miami.